It was a P E R F E C T day in the White Mountains. 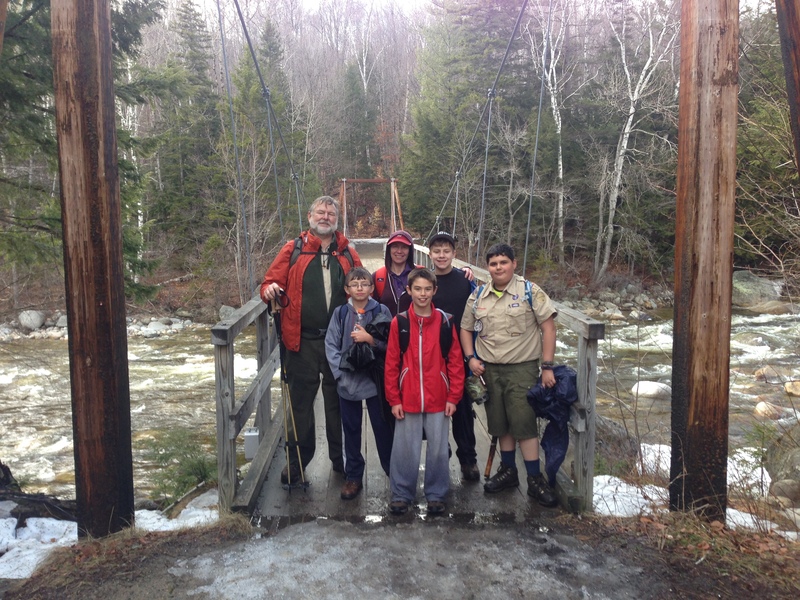 Every factor converged to render the hike for some of our newest scouts an experience worth remembering. The trail we selected was an alternate. Winter is releasing it’s grip slowly this year and it made no sense to lead the boys on a “post holing” adventure on some of the trails we initially considered. Instead we selected the Lincoln Woods trail to Franconia Falls. 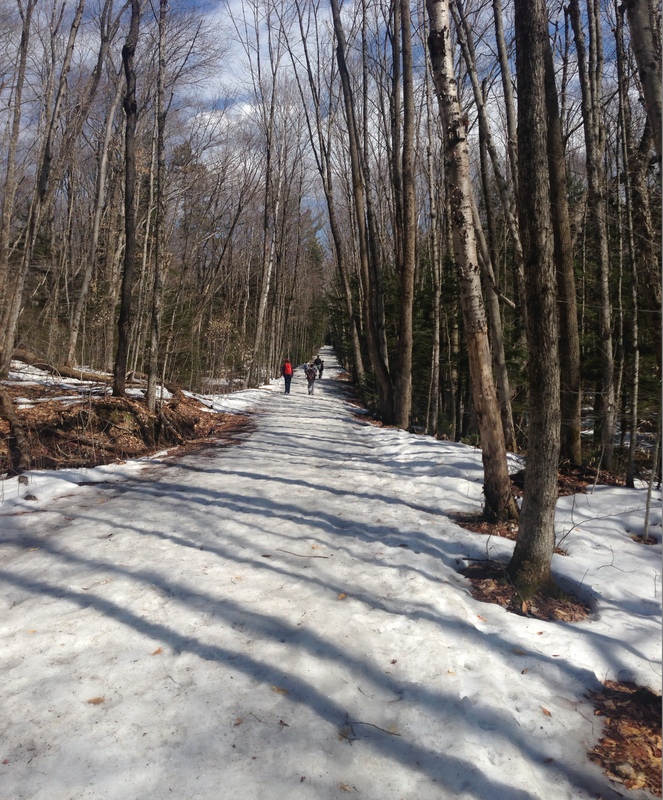 With few exceptions, the trail was covered in hard packed snow. Where it wasn’t was either ice or mud. Hiking was not difficult but definitely required more effort than I usually associate with a trail such as this one. For those who do not know, Lincoln Woods trail is built on the old rail bed that once carried timber from the Pemigewasset Wilderness. Old ties and spikes remain on the trail bed and, even with the snow and ice, were occasionally visible. This is a “first event” for “first year scouts”. These are scouts who a few weeks ago were still attending den and pack meetings. Now, they are Boy Scouts and are ready to see proof that the promise of adventure is real. As everyone realizes, the scale an adventure might have depends on the skill and experience of those being challenged. Too little and the boys will look askance at the promise while the lure of video games grows. Too much, however, and they will be overwhelmed and doubt themselves. On this day the change in venue and the accompanying weather made for an adventure of just the right proportion. For me, this adventure genuinely stretched me. My knowledge is solid and my skills have been tested under many circumstances but my endurance was definitely tested. Hooray! One older scout acted as our Troop Guide for the day and he provided much of the instruction. Together we introduced how to read a map, a trail guide, and make limited use of a compass to navigate the environment. It was delightful to observe how, on an almost perfectly straight trail, the new scouts had to work hard to orient the map to their environment and make decisions based on their understanding of their location. 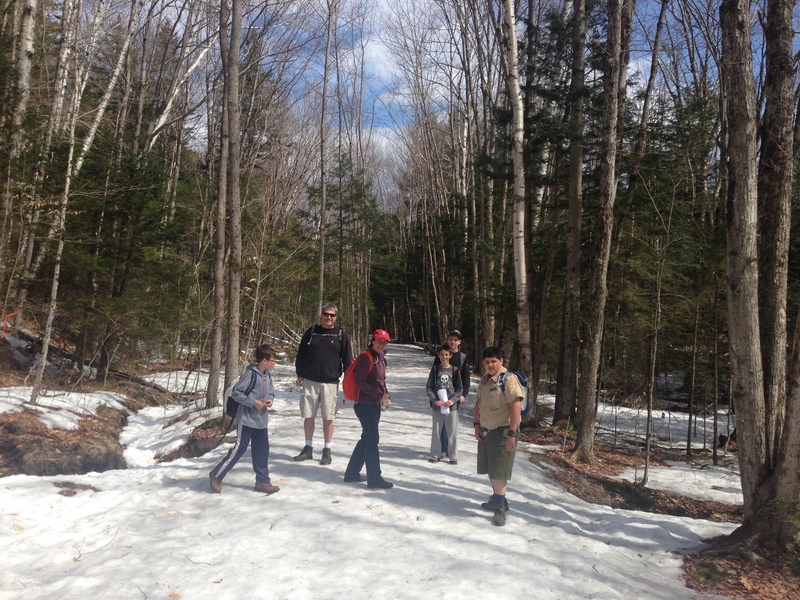 Shortly before lunch the scouts had a chance to measure their pace against a measured distance of 200 feet. It was fun to see their surprise when they learned to measure their pace as more than a single step. Surprisingly, they came up with reasonably accurate numbers for the length of their pace. As for me, I hobbled along at 47 paces per 200 feet. Lunch was a progressive affair. Even with snacks in hand, it was clear the scouts could and would have eaten much more if they could have carried it. Lessons were learned “the hard way” about making sure all gear was ready and at hand. Scouts weren’t the only ones who learned this way. The fine weather held for more than the first half of our trip but clouds began to thicken just before we reached the turn off for Franconia Falls. Our pace to the half way point was slower than I had hoped and the forecast 30% chance of scattered showers in the early afternoon looked like it would turn out to closer to 70%. Our lunch (a very late lunch) was curtailed by a rapid change in conditions. Hurried lunches varied from sandwiches to sardines with one scout digging into his provisions to cook some noodles. It was, thankfully, a very brief storm but before it ended the storm produced small hail stones. This seemed to add to the boys’ sense of adventure. I suppose, in another season, the canopy would have offered a little protection. However, the bare limbs and branches only helped a little. In typical New England fashion the storm cleared as quickly as it arose. Like others, I wonder what lessons I learned from this trip? First, I learned that the training I have pursued is time well spent. Knowing what to do and not to do in hazardous circumstances makes a huge difference in the outcome of any trip. Consulting weather forecasts, checking in with the Forest Service before setting out, and providing an itinerary to the Forest Service are key steps to a safe departure and return. Additionally, having the benefit of knowing the expert opinion of those familiar with the area paid off. If we had taken another of the trails we would possibly been at greater risk when the storm arrived. As it was, being outdoors in any thunder storm is dangerous but some spots are unequivocally more perilous. I am glad we returned without injury but I am also delighted that for the boys it was a genuine adventure. I asked one scout that I thought might have been a bit overwhelmed, “Was it an adventure and are adventures a good thing,” I got a smile and a thumbs up. For those who wish to know the details of skills the scouts began to develop they are the ability to locate their location on a map using the evidence of local terrain. Identify the difference between a proper topo map and a trail guide and the benefits each offers. Practice rudimentary trail etiquette when meeting or passing other hikers. Refreshing the fundamental aspects of leave no trace. Discovering where their endurance begins to fade and how to cope. Idenfication of weather indicators and proper responses. And, finally, a concrete understanding of what gear is required and the price of not being prepared. 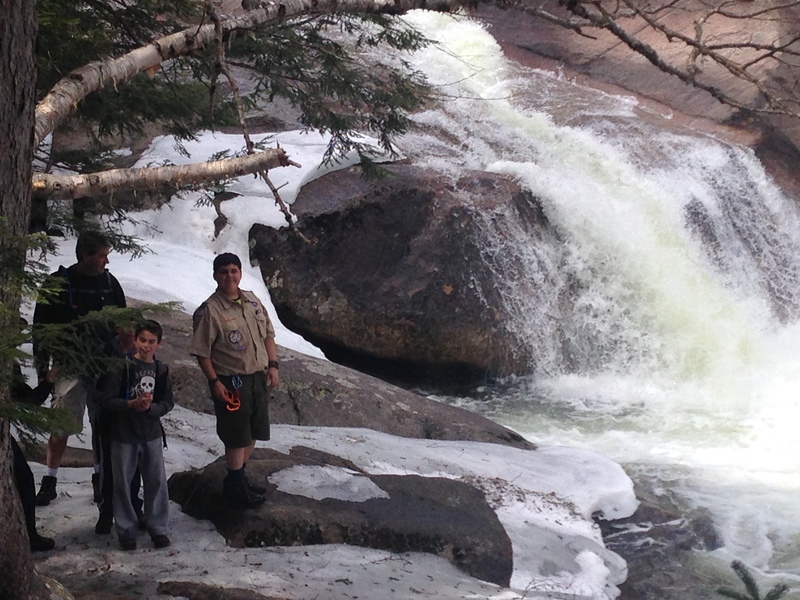 This entry was posted in New Scout and tagged boy scouts, early spring, endurance, franconia falls, hiking, lincoln woods, map, pace, weather hazards on April 21, 2015 by David Wilkerson.